355 x 268 mm. – 313 leaves with 4 Evangelist portraits, several illuminated headpieces, and numerous enlarged (some historiated) initials. With its perfect script and well preserved Evangelist portraits, this Byzantine book of the Gospels is a wonderful testament to the sophistication of Byzantine book illumination. A treasure almost entirely unknown, the discovery of this Gospel Lectionary was a major addition to the corpus of Byzantine illumination. With craftsmanship of the highest quality throughout, the lectionary is one of the greatest manuscripts from the height of the Byzantine empire and embodies the zenith of late 11th- to early 12th-century Constantinopolitan art. 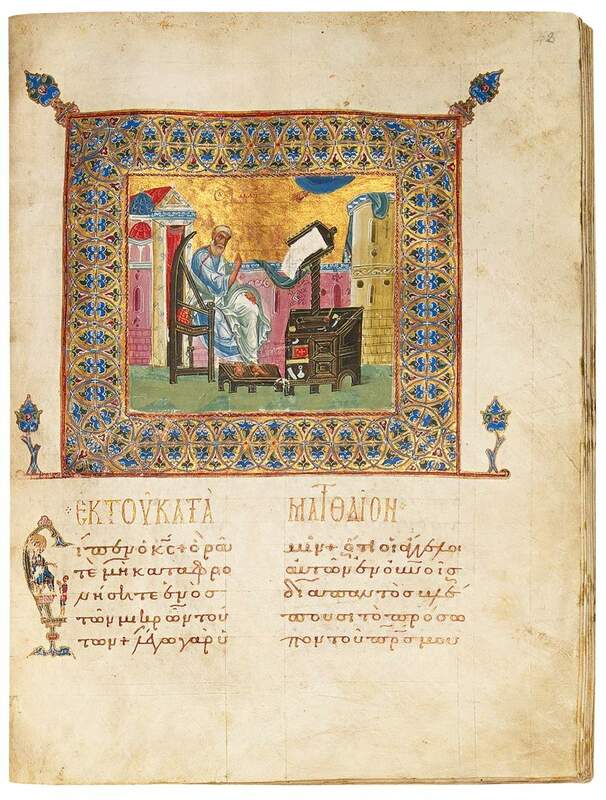 The attention lavished on the perfect script and the gracefully-preserved evangelist portraits attests to the evidence that book art was considered one of the greatest art forms by the highly sophisticated clerical and secular elite of Byzantium. This work is now in the collection of The Metropolitan Museum of Art in New York.